I read about this book in Vanity Fair and also in Entertainment Weekly. I have made a real effort of trying to read more short stories, and since this one is revolving around the human nuclear reactor known as relationships, it seemed a no brainer to try to read it. It doesn’t take long, because it’s barely 300 pages and a quick read. None of this takes away from the variety of relationship pitfalls that Taylor covers in this slim volume. These stories run all over the globe, from Hong Kong to Florida and all points in between, and run the gamut from downright depressing to puzzling. There is no shortage of odd situations that he addresses here; the man struggling to write the breakup letter, the widowed insomniac encountering an alligator (no, not a metaphor for a shifty dude, although I thought so at first) in her backyard, college friends (reminds me of the Big Chill movie) trying to hold together their splintered relationships, a man has a strange attachment to twins (again, not a metaphor, although my dirty mind did wonder), college students and lovers try to finish their dissertations, to comedic and potentially dastardly ends. No stone, no Freudian slips, and no emotional baggage is left unturned under Taylor’s microscopic inkwell. What to like, what not to like? I liked it all, including the eye catching yellow cover. The only thing I hoped for was a longer book. The thing about short stories and my usual reluctance to read them is that I really love to dive into characters. 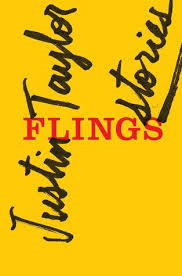 By the time I got into the headspace of some of Taylor’s characters, the story was over and I had to acquaint myself with new characters, and then it starts all over again. I would like to see a man of Taylor’s talent flesh his vision out over an entire book. That’s really my only complaint; and that the book is so short and goes so quickly. If you like short stories that make you question human nature and where the dastardly arrow of love shoots through it, this is the book to start that pondering with. ~ by generationgbooks on August 14, 2014.